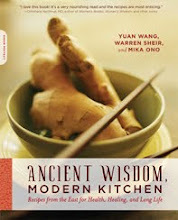 Ancient Wisdom, Modern Kitchen Blog: It's Here! I received my copy of Ancient Wisdom, Modern Kitchen: Recipes from the East for Health, Healing, and Long Life in the mail this week--it's finally here! I have to admit I had nightmares that the book would arrive with the cover on backwards or the type upside down or printed in purple ink... but my fears were unfounded. DaCapo Lifelong Books did a great job! Thanks to everyone there, especially our top-notch editor, Renée Sedliar. Ancient Wisdom, Modern Kitchen provides a refreshing look at how to heal while you eat. If we believe the adage that food is medicine then this book, through sections such as "Recipes for Common Health Concerns," provides both recipes for delicious eating as well as prescriptions for optimal healing. If you are so inspired, you can become a fan of Ancient Wisdom, Modern Kitchen on Facebook. See the book's Facebook page and help spread the word! I've been waiting for this book and I am so happy and excited that is here !!!!! We received our copy here in Toronto yesterday. Wild excitement! And celebrated by cooking for supper "SALMON WITH WOOD EAR AND CELLOPHANE NOODLES," substituting ordinary mushrooms for the wood ear.